Over the next couple posts, the Aquarium's Rescue Team will be sharing the in-depth story of an historic leatherback sea turtle rescue. For the latest news about the turtle, click here. It's been a while since I've blogged; guess I was waiting for something really BIG to happen. 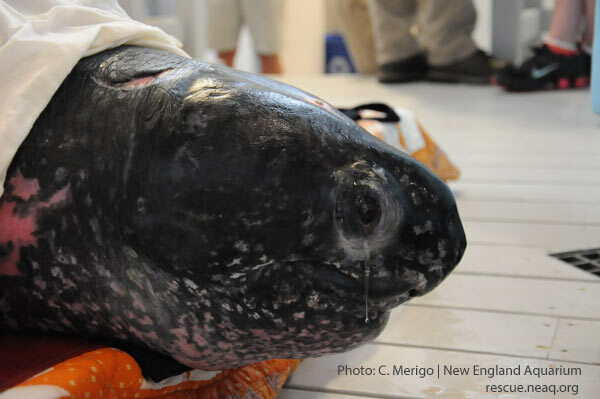 As many of you know from the wide media coverage, we recently rescued and rehabilitated a giant endangered leatherback sea turtle... a rare and difficult undertaking. (Learn more on the News blog about this here and here.) 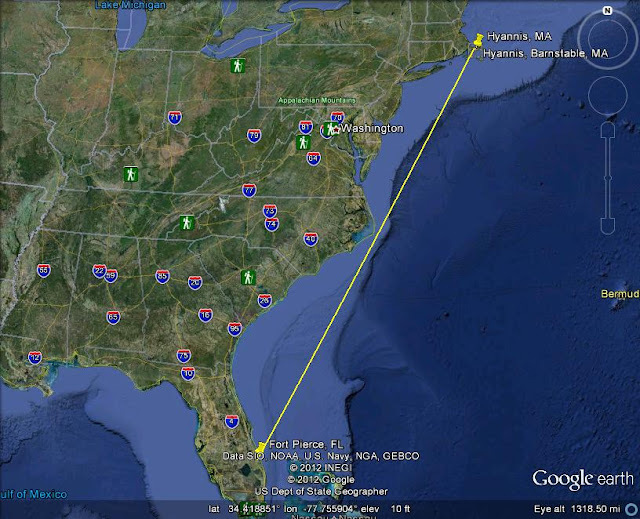 I plan to tell this story over several blogs due to the importance and detail involved in this rescue effort. The photo below shows the leatherback as our partners at the Massachusetts Audubon at Wellfleet Bay (WBWS) found him on the morning of September 20, 2012. It is important to note that this animal was actually found the night before at dark out on a mud flat in Truro, MA. It was deemed unsafe to try to remove this animal in mud after dark. For those of you who have never visited Cape Cod, the mud is notorious—you can easily sink to your hips with one step. The midnight tide helped move this animal to a more solid location as seen in the photo below. The staff at WBWS sent several photos while we were on route with the medical kits. This photo has a unit of measure next to the animal to help us visualize the size of the animal. The WBWS staff, with help from the International Fund For Animal Welfare (IFAW), were able to safely move this animal onto several stretchers and onto one of IFAW's specially designed large animal transport carts. Dr. Julie Cavin and I were able to examine the animal, collect and process a blood sample and provide some emergency support prior to the transport back to our Animal Care Center in Quincy, MA. 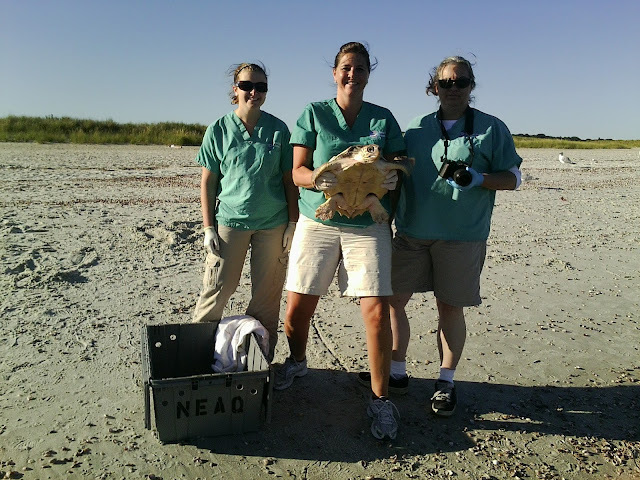 Once in our Sea Turtle Hospital, the animal was placed on a large pad of open cell foam while we collected vital information. We collected the same suite of information we collected in the field and compared the two sets. We also collected another blood sample for additional testing. 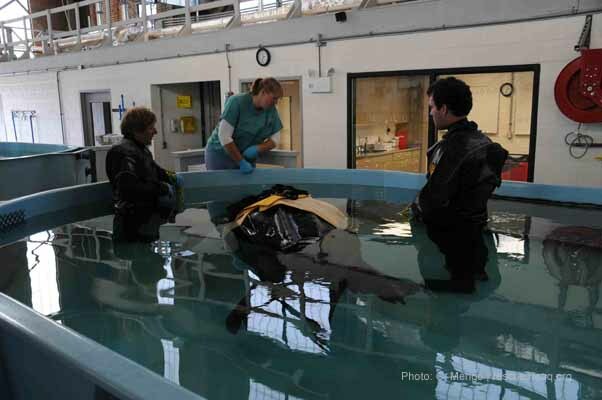 The Aquarium's chief of veterinary medicine, Dr. Charles Innis, was waiting for us upon arrival and began immediate medical treatment based on the blood results and other diagnostic information. We worked as quickly and quietly as possible for less than an hour and then moved the animal into a holding pool. In the photo below you can see a white discoloration around the eye that is not consistent with normal leatherback sea turtle coloration. This was caused by dermatitis. This turtle, while large, was under weight for his length and mature status. Weighing in at 655 pounds, this adult male should have been carrying more bulk. 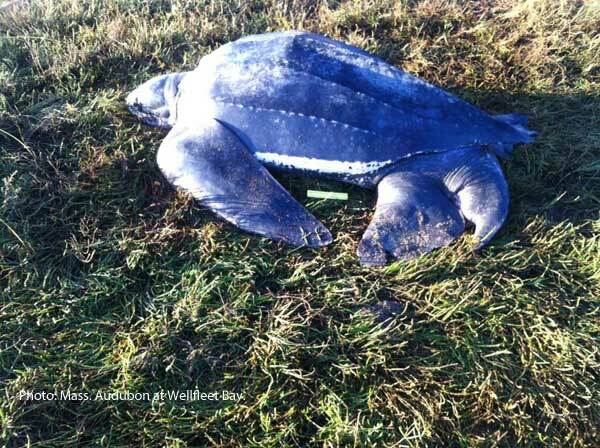 The turtle also had several soft tissue injuries that were not life threatening. I will detail those injuries with photos in a later blog. 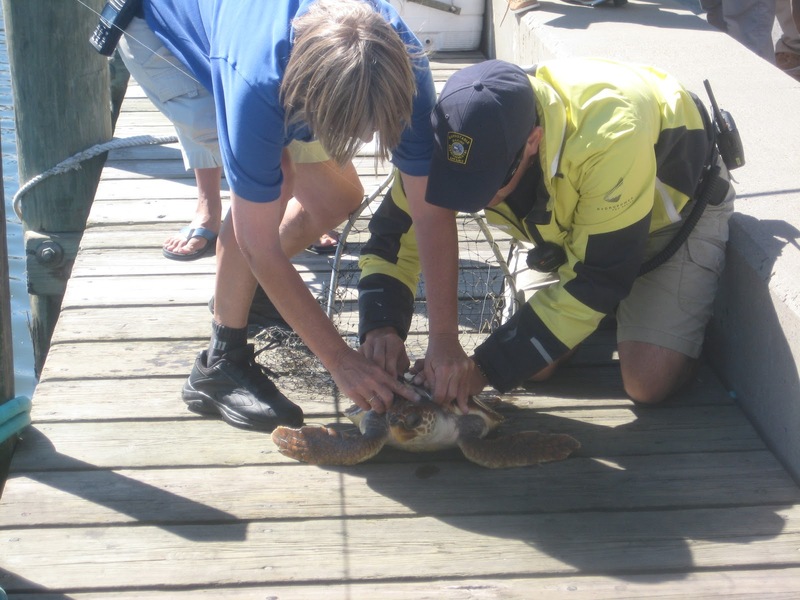 We wanted the turtle back in water as soon as possible to improve his chances of survival. Because leatherback sea turtles do not do well in confined spaces, we had several challenges. Their pelagic nature means they have never encountered walls. As a result this species will continue to try to swim forward or in every direction until it breaks free and can travel freely. 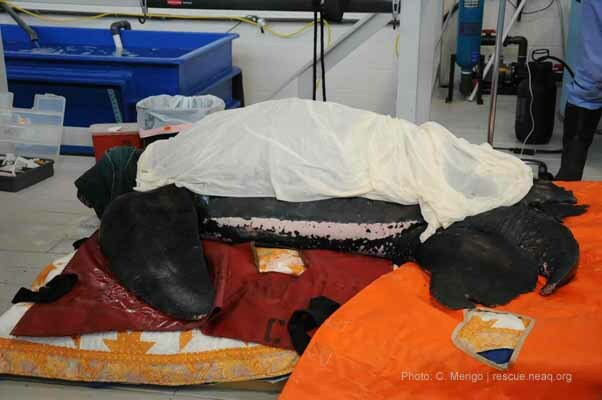 The photo below shows the leatherback shortly after we placed him in a hospital tank. Dr. Cavin can be seen in the background while two responders in dry suits stand ready to assist the animal if needed. 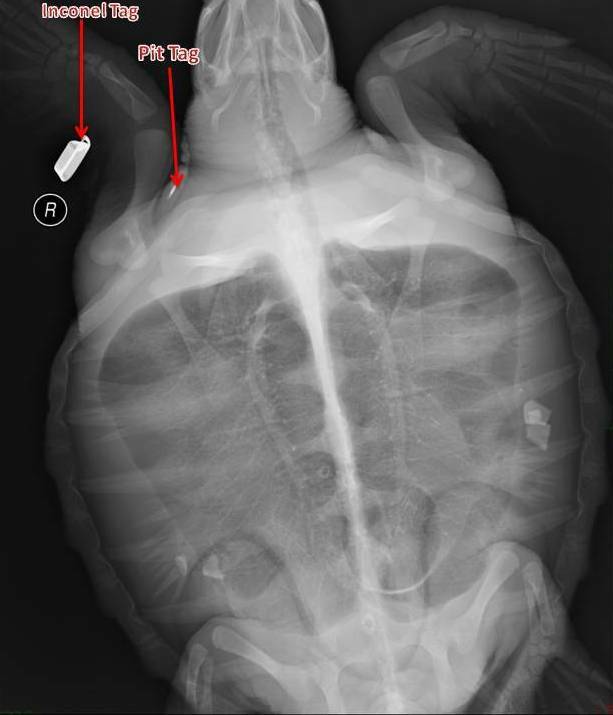 The yellow straps you see around the animal are part of a specially designed turtle stretcher. We left the animal in the stretcher for the first hour or two to help support him in the water. In the photo below, the turtle lifts his head to take a breath. 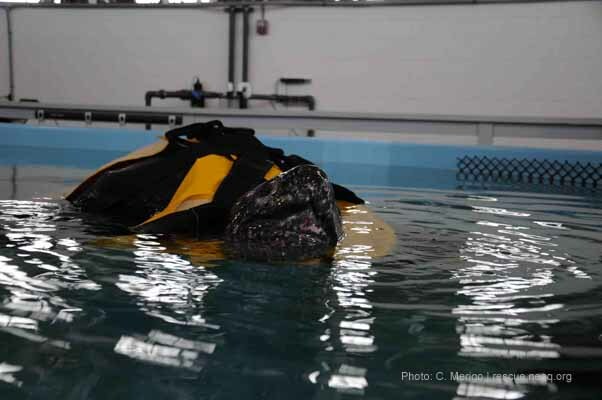 This photo shows the yellow turtle stretcher, which is not confining his flippers, and black straps that belong to a specially designed leatherback harness. At this stage in his rehab the turtle was still lethargic and made little attempt to challenge the walls of the tank. Photos of the stretcher and harness will appear in greater detail in the next several blogs. 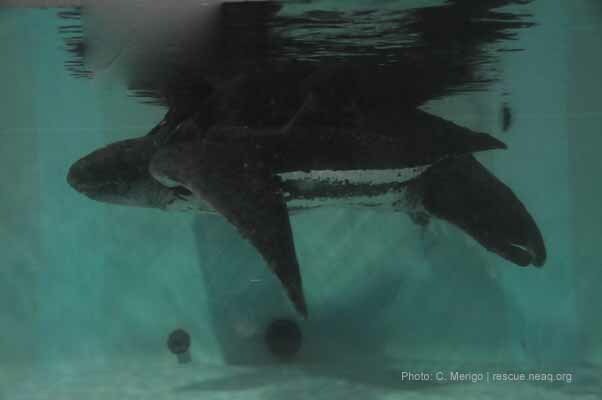 The photo below was taken through the glass of the hospital tank on the first day of rehab. This window allowed us to observe the animal underwater. In the photo you can see the front flipper in the foreground is in motion, the photo was taken as the animal was preparing to lift its head for a breath. By this time the animal was beginning to respond to the supportive care/medical treatment and no longer required the support of the yellow stretcher. Given that less than a handful of adult leatherback sea turtles have ever been rehabbed anywhere around the globe and even fewer that have survived to go on to be released back into the ocean, this is an important story to tell. 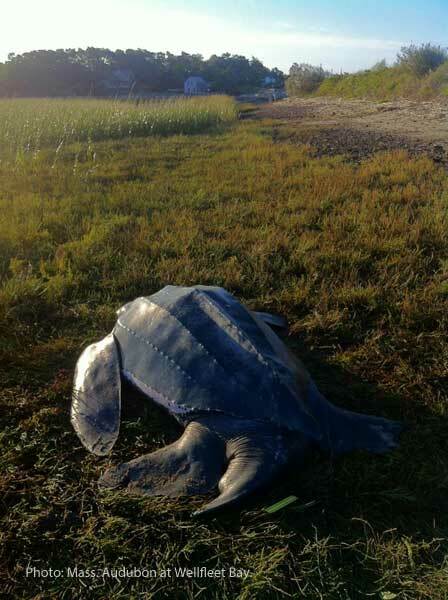 Stay tuned for more blogs detailing the chronological events of an incredible effort to save the life of this rare giant turtle. 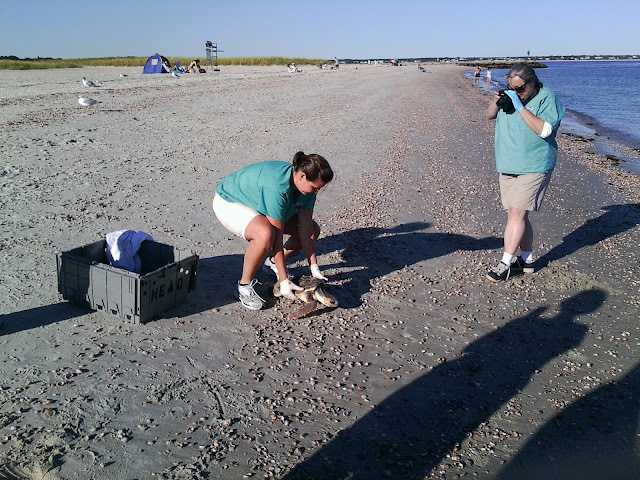 As you may remember all of our turtles had been cleared for release. Unfortunately, as is sometimes the case, one of our turtles dubbed Cyclops (17) developed a late infection and had to be held back. One of our great summer interns Lara is holding Cyclops prior to the start of therapy. Just prior to the release in NY we started noticing swelling in some of the turtle's flipper joints and it started to favor the right front and the left rear flipper. The swelling became progressively worse and the turtle's appetite started to diminish. At this point in rehab any one of these things is worrisome. We took radiographs and blood cultures. We also took needle aspirates of the swollen areas. Hard to see but there is moderate swelling in the right front flipper wrist and elbow area. Less intense swelling in the left elbow region. Here you can see the left rear knee has some pronounced swelling. 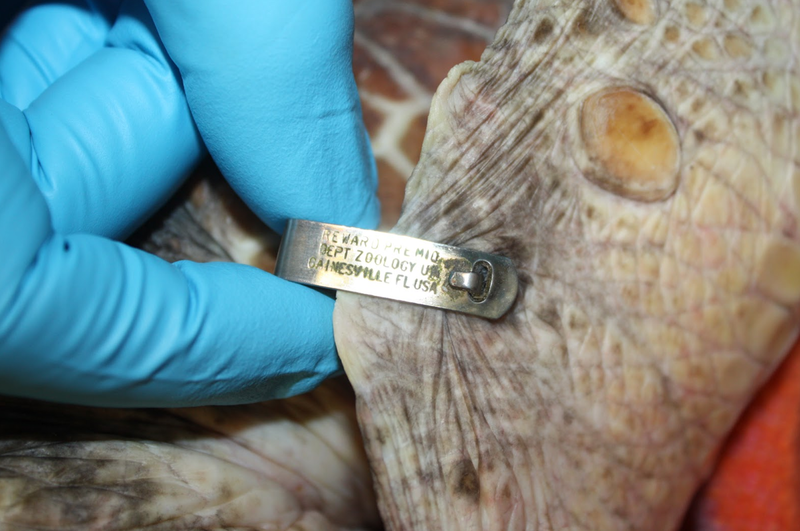 When all the results were in it turned out this turtle has a systemic infection. We started treating for the infection but the swelling did not seem to diminish. As we continued the antibiotics we also started using a laser for the edema (swelling) of the joint area. Our turtle's namesake Cyclops from X-men. It seemed fitting that Cyclops would be getting a laser treatment. 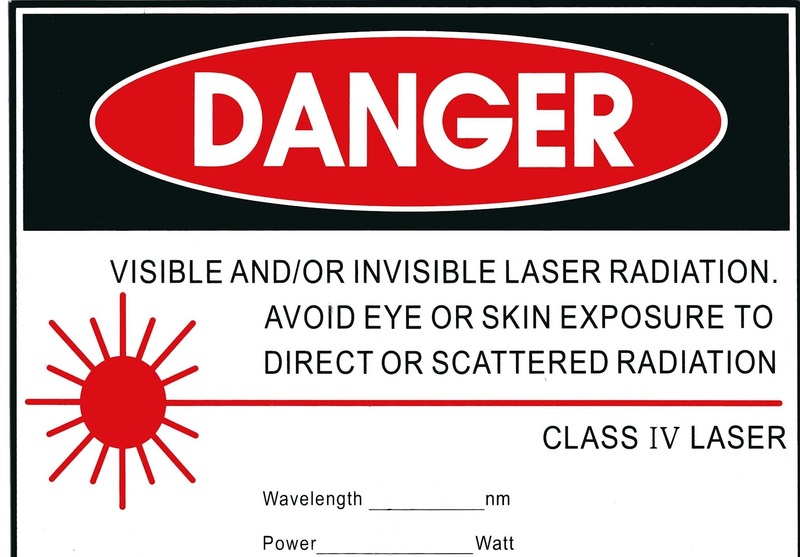 The LiteCure Companion Laser unit. 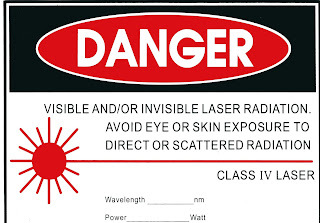 "The Companion therapy laser system sends photons, or packets of light energy, deep into tissue without damaging it. These photons are absorbed within the mitochondria of the cells and induce a chemical change called “photo-bio-modulation”. This light energy then inspires production of ATP in the cell. ATP is the fuel, or energy, cells need for repair and rejuvenation. Impaired or injured cells do not make this fuel at an optimal rate. Increased ATP production leads to healthier cells, healthier tissue, and healthier animals." If interested in more of the biological/physiological explanation on laser therapy check out LiteCure's webpage here. 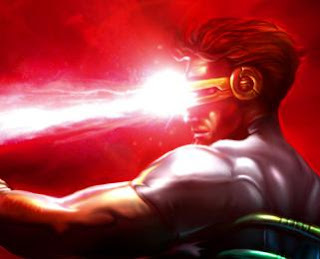 The cool glasses aren't just a fashion statement, they provide protection for our eyes from errant laser beams. Unfortunately they don't make glasses for the turtle so when we are doing therapy on the front flippers we make sure to cover its eyes. Cyclops eating a squid head. Cyclops chasing after a piece of squid! The swelling has diminished and the turtle is eating so much better now! We still have to wait and re-culture to make sure the turtle no longer has the infection. 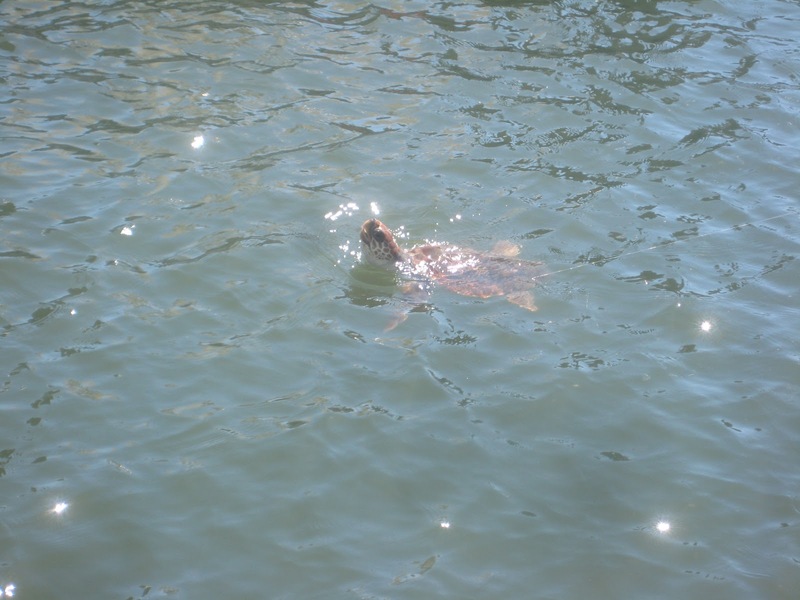 But, we are all hopeful that this turtle will be back in the wild very soon!